Take Current Affairs quiz March 11, 2019 to enhance your General Awareness. Practice with our esteemed Current Affairs quiz March 11, 2019 questions which covers all important events across India as well as World. Make use of all important Current Affairs quiz March 11, 2019 questions with answers updated here, at free of cost to succeed in all competitive Exams and Interviews. India stands world's _______ largest in arms importing from 2014-2018 as per the Stockholm International Peace Research Institute (SIPRI). According to the latest report published by the Stockholm International Peace Research Institute (SIPRI), India was the world’s second largest importer of major arms in 2014–18 and accounted for 9.5% of the global total. Where was the 8th GeeBee Boxing Tournament held? The 38th GeeBee Boxing Tournament was held in Helsinki, Finland. What is the current repo rate of RBI? The current repo rate of RBI is 6.25%. Who is the Chairperson of State Bank of India (SBI)? Rajnish Kumar is the Chairperson of State Bank of India (SBI). What is the age of the woman who was recently honoured as the world’s oldest living person by Guinness World Records? Which Bank has introduced the linking of interest rate it offers on savings account deposits to the RBI’s repo rate? State Bank of India has become the first domestic bank to link the interest rate it offers on savings account deposits to the Reserve Bank of India’s repo rate, an external benchmark. Who won gold in the 56Kg category boxing at the 38th GeeBee Boxing Tournament in Helsinki, Finland? India has launched _______ IT corridor in China. NASSCOM entered into a partnership with China's Xuzhou city from Jiangsu Province in China to help develop the IT corridor. This is India's third IT corridor in China. The NPPA has reduced the MRP pf 390 non-scheduled cancer medicines up to ________. The National Pharmaceutical Pricing Authority (NPPA) has reduced the MRP of 390 non-scheduled cancer medicines have been reduced by up to 87%. Under which MInistry does the National Pharmaceutical Pricing Authority (NPPA) function? National Pharmaceutical Pricing Authority (NPPA) is an independent Regulator for pricing of drugs and to ensure availability and accessibility of medicines at affordable prices under the Ministry of Chemicals & Fertilizers. The Ministry of Power announced the power rating for microwave ovens and washing machines. Which body undertakes the rating of electrical appliances? The rating of appliances in India is undertaken by the Bureau of Energy Efficiency. Bureau of Energy Efficiency is a statutory body set up under the Energy Conservation Act, 2001.
Who is honoured with Golden Peacock Award 2019? ACKO General Insurance is honoured with Golden Peacock Award 2019. Which country won the First Prize at The International ‘Golden City Gate Tourism Awards 2019’ in the category of ‘TV Cinema Spot’ at ITB, Berlin? India country won the First Prize at The International ‘Golden City Gate Tourism Awards 2019’ in the category of ‘TV Cinema Spot’ at ITB, Berlin. Who is the Secretary General for Federation of Indian Chambers of Commerce and Industry? Shri Dilip Chenoy is the Secretary General for Federation of Indian Chambers of Commerce and Industry. Are you looking for right place to enhance your Knowledge on Current Affairs of 11th March 2019 through effective Quiz section? FreshersLive grants you the advantageous Current Affairs Quiz questions with accurate answers for 11th March 2019 which covers all the important events, supreme Awards, major occurrences in the National as well as World level. All important Current Affairs Quiz questions of 11th March 2019 are updated instantly in this page. Everyday at least 25+ Current Affairs Quiz Questions are displayed in this FreshersLive page. Correct Answer for each quiz question is given at the end of the entire 11th March 2019 Current Affairs Quiz questions section. You can estimate and upgrade your GK by attending these useful quiz questions. 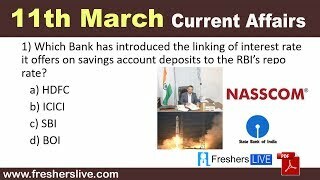 Entire quiz questions of 11th March 2019 Current Affairs covers Competitive Exam as well as Interview point of essentially important topics like International News, National News (ie. Indian Affairs), Science & Technology News, Environmental News, Bills & Acts Passed by Government, Defence News, About important Persons, Places, Banking & Economical News, Awards & Honours, Sports News, Revolutionary Updates on Arts & Culture, Obituary, Summits & Conference, Important Committee, Schemes, Appointments, Important Days & its Theme for Current as well as upcoming Year, Books & Its Authors, Agreements & MoUs, Budget, Taxes, Various Important Lists & Indexes, Visits by World Presidents, Prime Ministers, Political affairs and all Current Events. 11th March 2019 Current Affairs Quiz Questions updated in this page are prepared in the sense to help all aspirants to succeed in various Competitive Exams like UPSC IAS and other Civil Services Examination, Various Bank exams like IBPS PO, IBPS Clerk, SBI PO, SBI Clerk, RRB PO, RRB Assistant, Insurance exams like LIC AAO, UIIC Assistant, Railway Exams, Various Central Government Exams like SSC CGL, SSC CHSL, and more. Attempt all the Current Affairs Quiz Questions of 11th March 2019 and evaluate your score by matching your response with the correct answers mentioned at the end of this quiz questions section. By practising the FreshersLive Current Affairs Quiz Questions on a daily basis, you can surely succeed in the competitive exams as well as the interviews easily. Make use of this ultimate resource to the fullest and quickly achieve your goal!